Every Wednesday we have a new sketch challenge at Freshly Made Sketches for you to try. 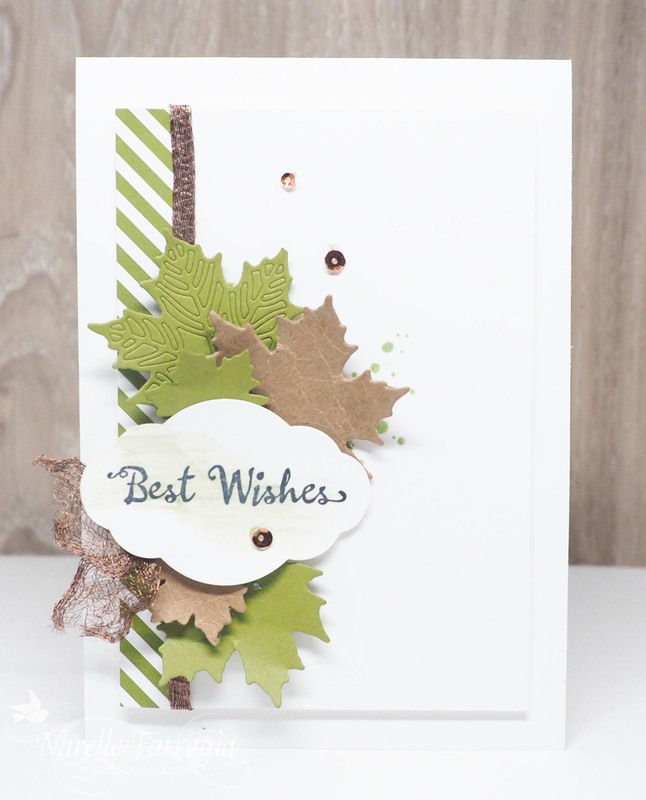 This week our sketch has been designed by my fellow “Down Under” card creator Karren Johnson. Kiwis and Aussies are called this as our countries are below many of the other countries on the globe. Karren is the Queen of Backgrounds and truly gorgeous cards. 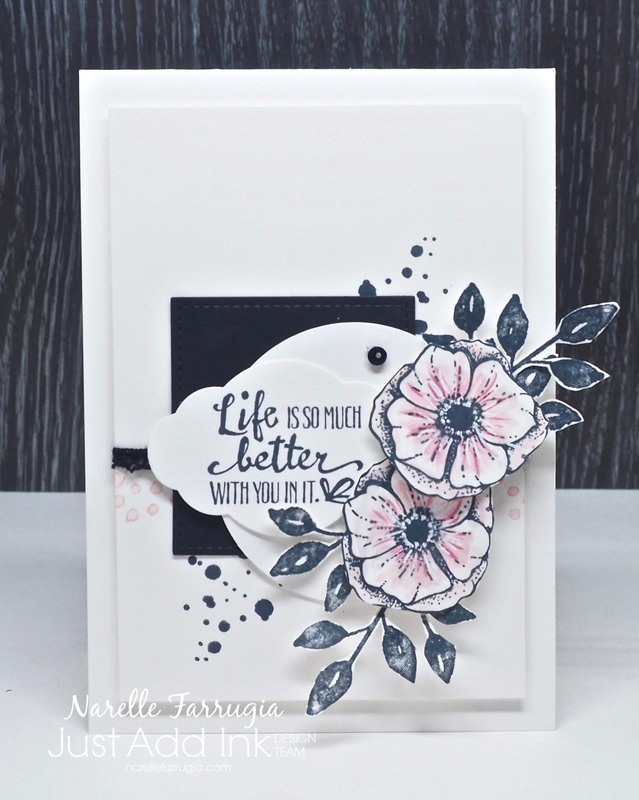 Head over to her blog and take a look at her wonderful cards. This is my first Christmas card for 2018! Pretty chuffed with myself for starting my cards in April rather than leaving them until the last minute as I’ve done before…..many times in fact. 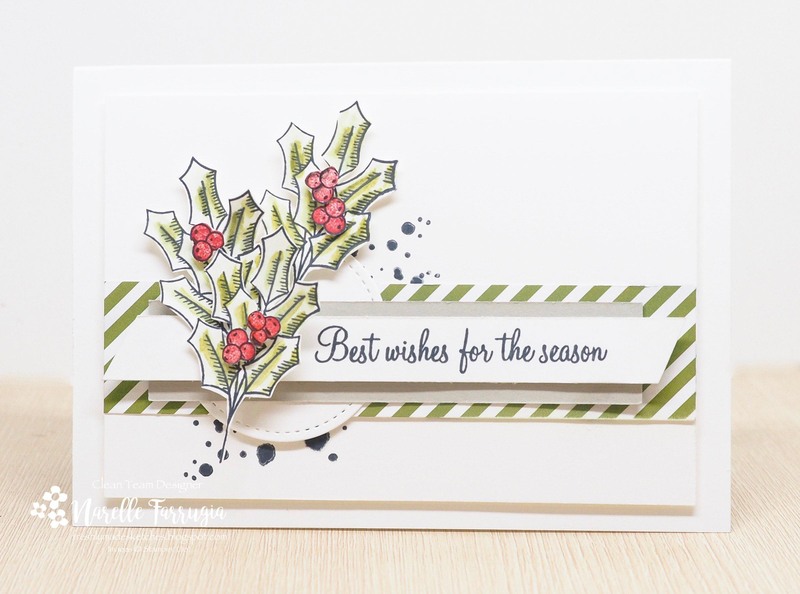 The holly I’ve used for my card is from Holly Berry Happiness. I gave my leaves a seriously quick watercolour with Old Olive Ink and my berries are coloured with Cherry Cobbler Ink. I used the solid stamp from the set to colour the berries. I then fussy cut them all out and raised them with Mini Dimensionals. 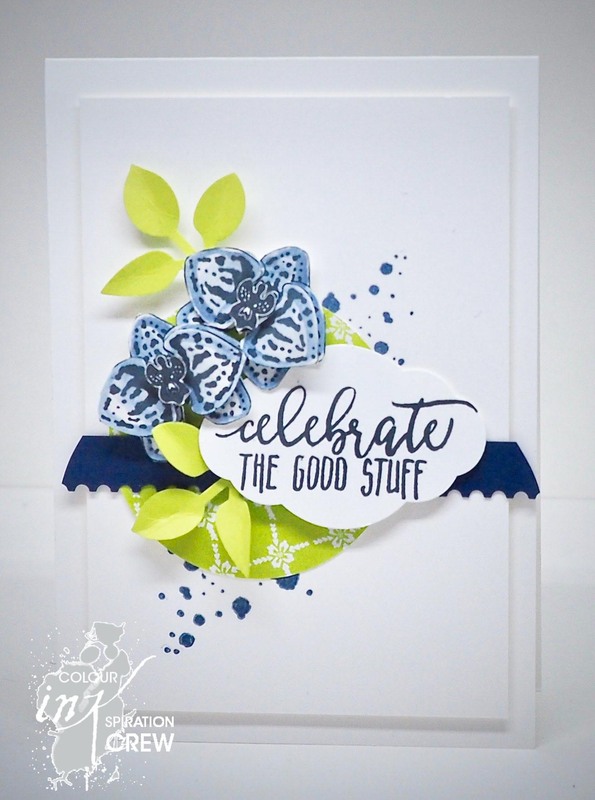 The sentiment is stamped in Basic Black Ink and is also from Holly Berry Happiness. I had a strip of Sahara Sand Cardstock laying on my desk and decided to add it under the sentiment as I liked this colour combo together. I then added a strip of striped DSP from Merry Little Christmas DSP. 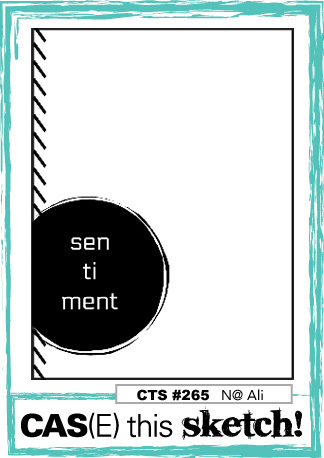 The background ink splatter stamped in Basic Black Ink is from Swirly Bird. I wasn’t too sure about using black for the ink splatters, but it’s grown on me the more I look at it. 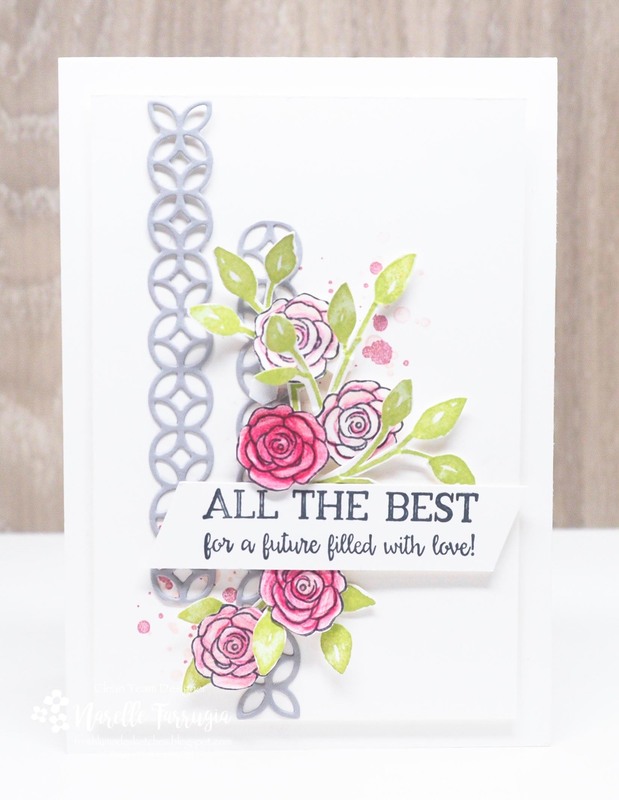 The team at Freshly Made Sketches have created amazing cards using Karren’s sketch. Head over to Freshly Made Sketches and see what they’ve created. CAS(E) this Sketch has a fabulous sketch this week. As I’m on hols with family, I’ve only today managed to find some time to create a card for the challenge. I’ve been trying to sneak away all week to play along! I am in LOVE with these leaves from Seasonal Layers Thinlits Dies. I knew I wanted to use them as soon as I saw the sketch. I cut off a strip of the stripe-y DSP from Merry Little Christmas DSP that I thought worked perfectly with the sketch. What colour works best with Old Olive? Crumb Cake……however, I forgot to bring some with me….. The only cardstock I had in a similar colour was the backing board from a make and take from an Onstage Event that I had somehow packed. Even though it’s not quite Crumb Cake, I think it works well. As this backing board is really thick the die wouldn’t cut the entire way through so my leaves were a little crushed when I separated them. I figure that’s how leaves look when they’ve fallen to the ground anyway. The sentiment that I’ve used was chosen because it fit in my Label Punch. The sentiment is from Petal Palette. I added a bit of a washed look behind the sentiment with my Old Olive Watercolor Pencil. I just noticed my ribbon is a tad offline at the top……I’ve now lined it up properly, but have already put away my light tent and it’s too late to pull it out again to take another photo. Wednesday’s seem to come around in the blink of an eye! It feels like the weeks are flying by and before we know it, Christmas will be here! 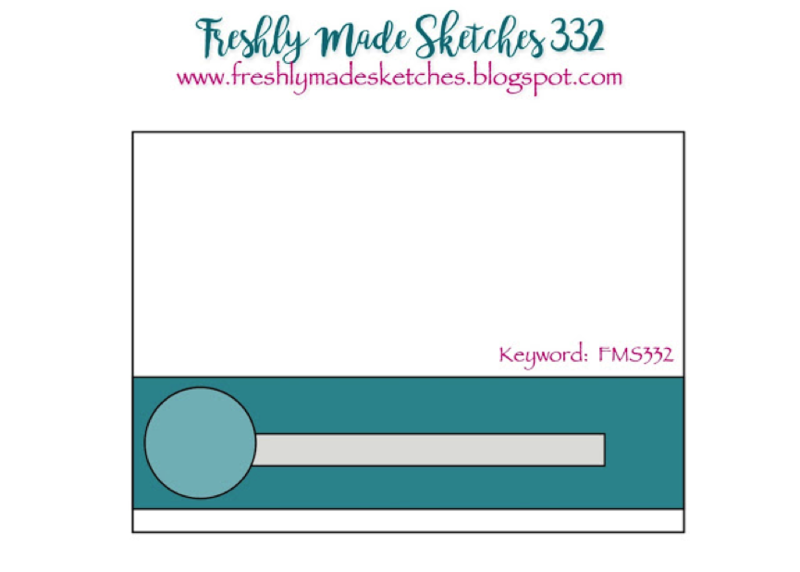 We have a new sketch challenge at Freshly Made Sketches for you. Our sketch designer is Jen Brum. Jen’s cards are creative, clean and so very striking. Head over to her blog and take a look. I’ve had a couple of requests for wedding cards lately and have non in my stash. I chose Jen’s fabulous sketch to start off my wedding card collection. My leaves are created using my Seasonal Layers Thinlits Dies. 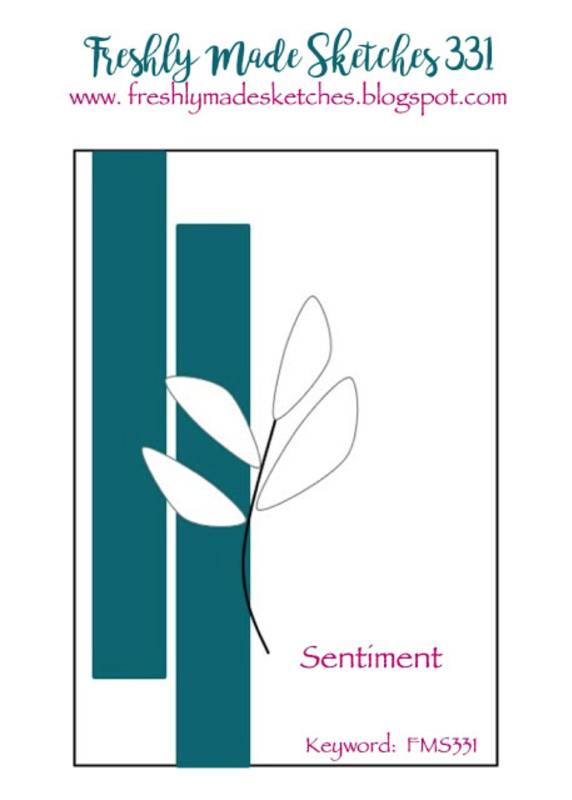 The colours I’ve chosen for my card are Sahara Sand, Old Olive and Whisper White. To create the larger leaves, I inked up a silicone mat with Sahara Sand and Hello Honey Inks. I then spritzed the ink with water and applied some Whisper White Cardstock directly on to the mat. Once the cardstock dried, I then ran the cardstock through my Bigshot with the larger leaf die. 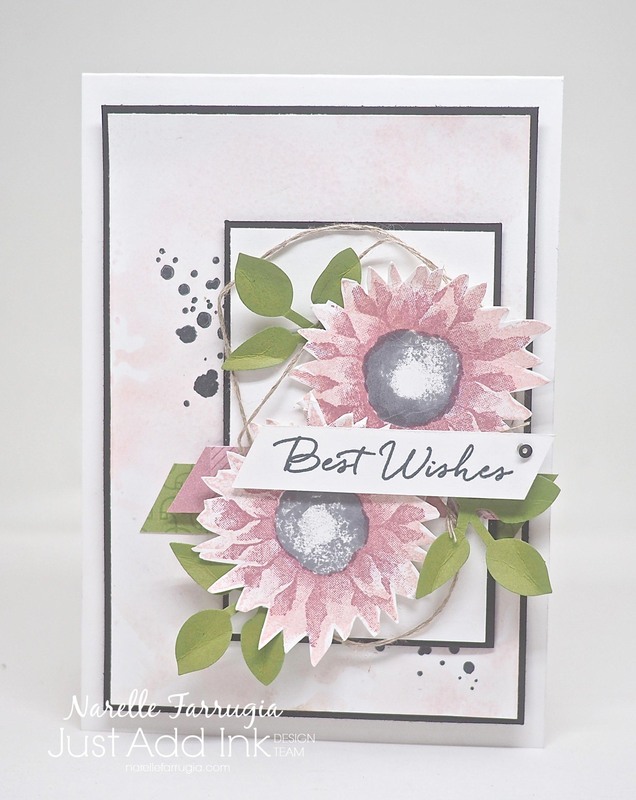 I stamped the ink splatter stamp from Swirly Bird in Sahara Sand Ink and stamped on to my card base. I then added my sentiment, the strips of cardstock and some Linen Thread. To add a little bit of wedding bling, I then finished off my card with a sequin. The Clean Team at Freshly Made Sketches have created gorgeous cards to inspire you. Pop over to the blog and see their creations. 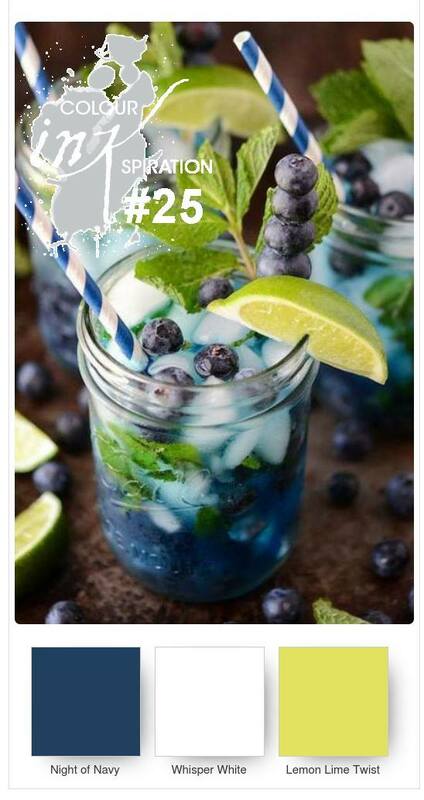 We would love it if you could join us with this colour challenge – click here to show us your creation. As soon as I saw these colours, I knew I wanted to create a card with blue flowers……I actually had to google if there is such a thing as blue orchids. And there seems to be! I don’t think I’ve used the correct leaves with my orchid, but I just liked the look of these Lemon Lime Twist leaves punched with my Stampin’ Up! Leaf Punch. Next hop along the way is my fellow Melbournian, Rachel Palmieri. She has created a gorgeous card to inspire you to join us with this challenge. Make sure you hop the whole way around to check out the amazing cards the team have created. 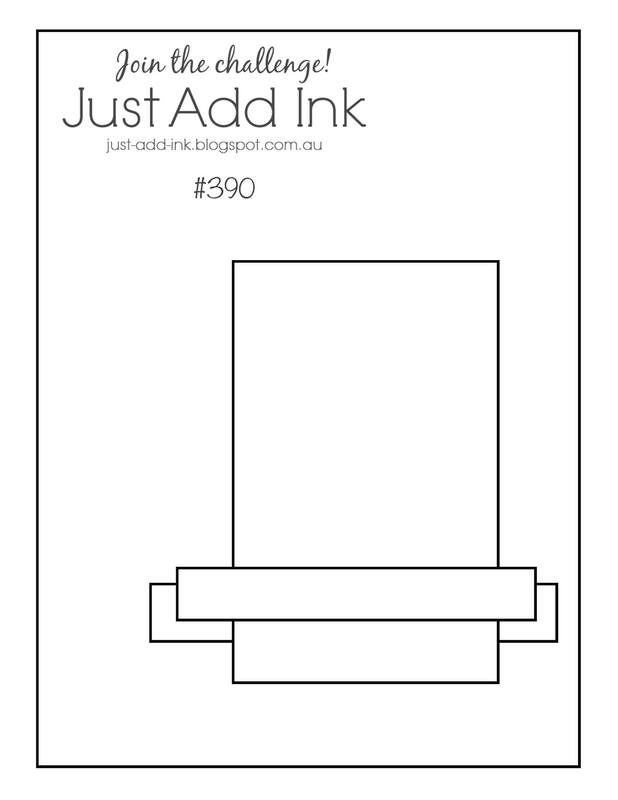 There’s a new challenge at Just Add Ink. This week is sketch week and I’ve designed the following sketch for you. The card I’ve created is another floral creation. The Stampin’ Up! stamp set I’ve used is called Painted Harvest. The flowers are a two-step stamping set. The colours I’ve used for my flowers are Sweet Sugarplum and Blushing Bride. I stamped two of these flowers and fussy cut them out. The centre of my flowers are stamped with Smoky Slate. 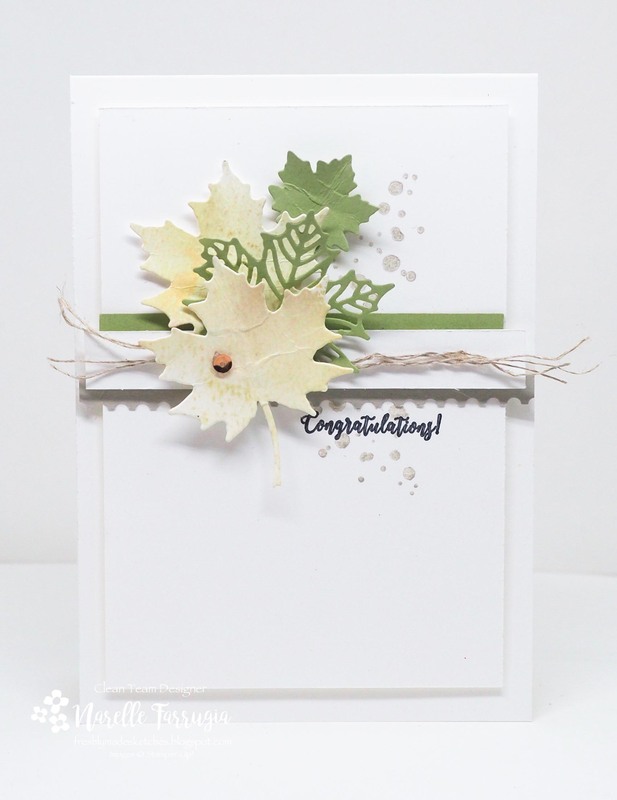 The leaves are punched with my Stampin’ Up! Leaf Punch. To create the background on my card I used the Smooshing Technique with Crumb Cake and Blushing Bride Inks. I then used the water droplets stamp from Swirly Bird in Basic Black Ink. 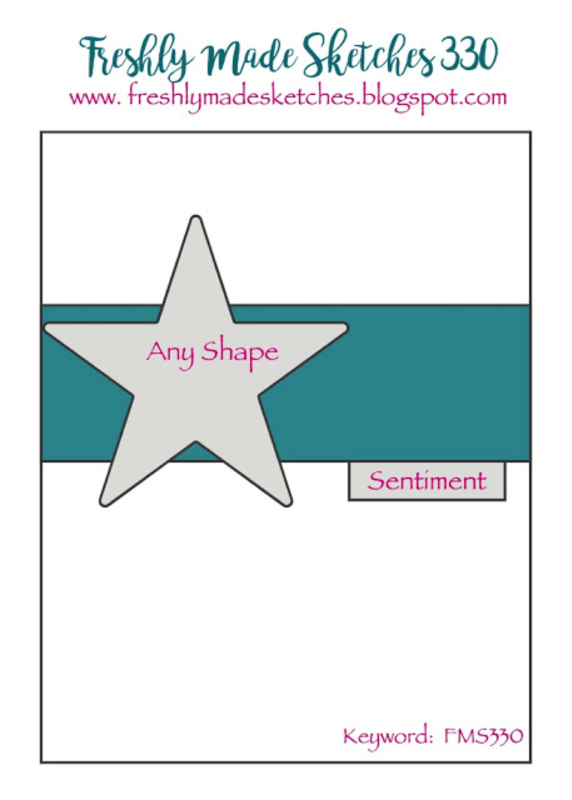 The sentiment I’ve used on my card is from Blooms and Wishes. I then added some Linen Thread to loop under my flowers and leaves. We would love it if you could join us with this sketch challenge. Head over to Just Add Ink and take a look at the gorgeous cards the team have created.